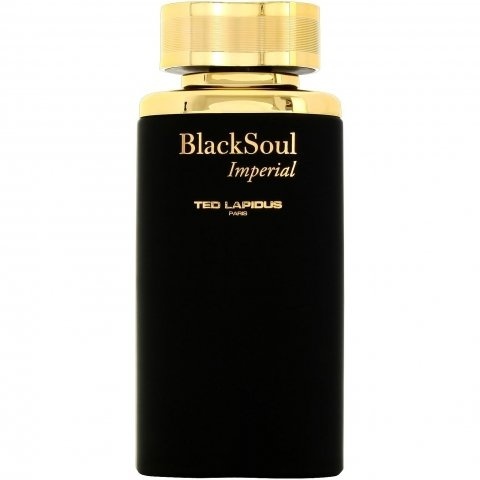 BlackSoul Imperial (Eau de Toilette) is a popular perfume by Ted Lapidus for men and was released in 2009. The scent is spicy-woody. It was last marketed by Groupe Bogart. ... The idea for such an advertising slogan plays somewhere else, but what the hell. It's just a very practical tin can, which is the home of the bottle. The finely dispersed mist develops on the skin into an even more "hot" fresh espresso. Then the saffron is added. It's like smelling a bag of coffee beans and the excellent "cake spice" at the same time, but not in the narrower sense of "gourmand". Rather very dark aromatic-spicy. Still quite "hot". It immediately causes a "frost fur" on the skin to sink down and feels comfortable. It stays that way for quite a while, although in the background there are more beautiful scent chords already attracting attention. First very subtly, then more and more wrap the "pre-scent" around it, wrap it up without suppressing it. Warm amber and tart woods and the "inky" chord of birch tar (leather). Restrained, elegant, yet powerful, the overall fragrance of "BlackSoul Imperial" comes to the fore. It lasts a very long time without changing much (only a quiet "bubbling" inside the fragrance can be heard). The Sillage is good without being obtrusive. For my nose, the perfume fits rather into the colder season, because it seems so "densely woven and warming". And dark. The kind of darkness that is mysterious, slightly "magical" but always benevolent. In the meantime I already got to know several scents of Ted Lapidus and each one is well made in its own way and no copy of another scent brand. Slight similarities may well exist, but independence is always in the foreground. So is "BlackSoul Imperial". for me and an absolute powder scent. At the beginning bestialisch sweet and so durable, as I have experienced it with no EDT before, and I have tested some. A sprayer is enough and you fog in a whole room, actually. He starts minimal citric (orange/mandarin) and immediately goes into a resinoid incredibly dense and fat thing about which smells so strong, yes smells and does not smell that it is borderline. I hardly notice coffee, just a little bit of orange with a very dark sweet saffron and oud base. Absolutely too much for me, but then after about 1 - 2 hours a fragrance comes which is zero synthetic, not even the sweetness, which resembles something Rive Gauche, so beautiful French and reminds mainly of a better, less old-fashioned Royal Copenhagen. Very powdery and also valuable. But in my opinion it has zero freshness - it smells good, but for me it can only be worn at very strong minus degrees. Now it comes; I wanted to give it away due to lack of freshness and mixed it with Pino New Year's Eve for fun. Result: professional mixture. Absolutely coherent, neither kills the other. The result is a Fougere-like, slightly green, but very warm powder scent, which for me looks like from a perfumer's hand. Really very good - now I'll keep it. Weirdest perfume i ve smelled for sure.I dont understand what im smelling and i definetely dont pickup any of the notes listed...All i smell is clothing softener with a bit of rive gauche some powder and some spices.The smell is definetely unique and very mysterious.its among the best perfumes i ve tried.Its like a very warm aristocratic scent suitable mostly for a rich gentleman. This one is a hidden gem for sure,thank god,as not too many people are aware of this perfume.This one gained a spot on my top list. Projection and longetivity are among the best i have in my collection.It projects for 2 meters for an hour and longetivity is 8 hours solid on my skin. 25$ for such a GEM ? Really ???!!! A very worth addition to your collection and very nice wearing on the skin! Highly pleasing "blind buy"!